Well, first we had one kid. "They" said "buy a minivan". We said "um, three people fit fine in our car". Then we had another kid. "They" said "buy a minivan". We said, "er, four people still fit in our car." 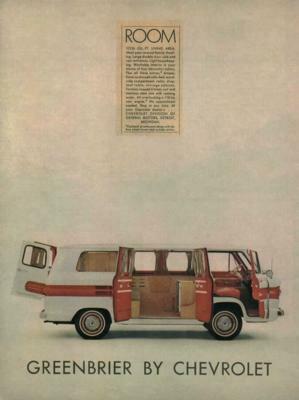 But, we rented a minvan once on vacation. Hmm, handy, says we. 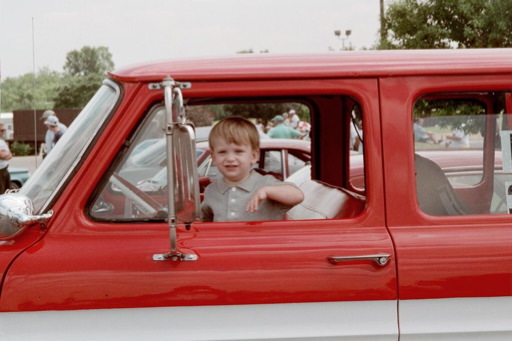 But, neither of us really wants to drive a minivan all the time. So, we bought our Neon. Then we had kid number three the fall of '99 and though we all fit, going to the local warehouse store with the stroller and buying the 24 pack of TP and the giant box o' diapers just didn't work, not to mention vacations and such. Oh God! You bought a minivan! 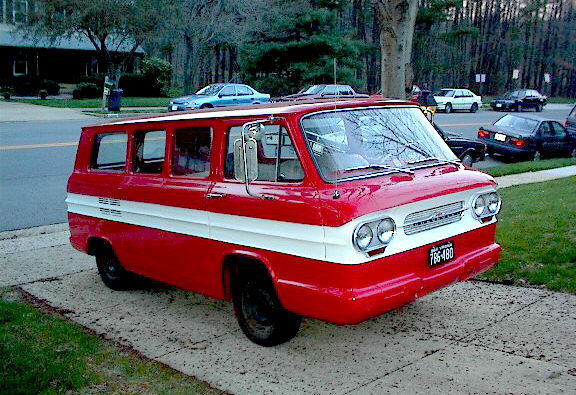 So, in March of 2000 we drove home from the Corvair Ranch in our '64 Deluxe Greenbrier :-) Overall, it's in good shape body wise, we went looking for one that was pretty solid. The bad part is that it was driven into the ground a bit, so it's a little tatty around the edges. The most major problem was that the rear had a loose pinion, big thanks to the Ranch for finding us a good correct used rear and installing it, along with seatbelts, rear bearing grease, heater hoses and t-stats, and a few other odds and ends, all for a very reasonable price. It still needs some TLC, but at this point it runs and drives reasonably well. Us: Well, we bought a minivan. Them: Oh, no! (You'd have thought I told them there was no Santa). Us: Well, you know, with three kids you really need a minivan. Them: Yeah, that's true. So what did you get? Them: Ah. Is it in good shape? Us: Yeah, it needed a few things, but it runs pretty well. Them: That's good. Gotta get something solid for the kids. Us: You're absolutely right. That's why I had seat belts put in. 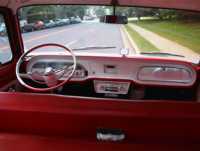 Them: Replace the seat belts? Why, were they messed up? Us: Oh, no. There weren't any. 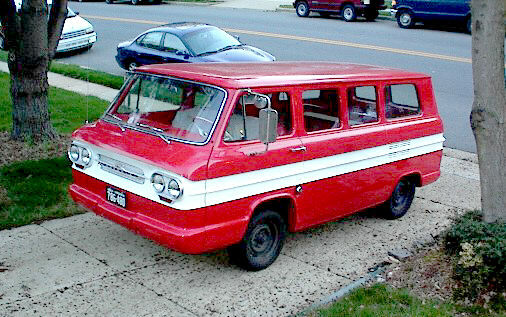 Them: What, was this a cargo van or something? 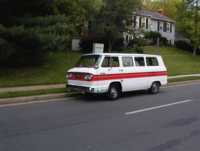 Us: No, no, it was a passenger van. They just didn't come that way. Them: Saaaay, what year is this van? (The light is beginning to dawn). 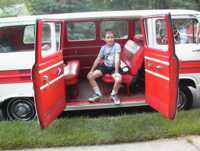 For those of you who might be interested, ours is White/Red, with a red two tone interior, two tone interior, third seat, 110/PG, chrome bumpers, dual "west coast" outside mirrors, direct air heat, and a spotlight. From what I've seen, that's just about everything you could get except for a posi. Two of the previous owners added some fog lights (since removed), an elec fuel pump, f&r swaybars, and an elec fan in the right air inlet (also removed). We added seat belts for the rear seats, carpeting, and a stereo, then drove it to the CORSA International Convention in July of 2000. 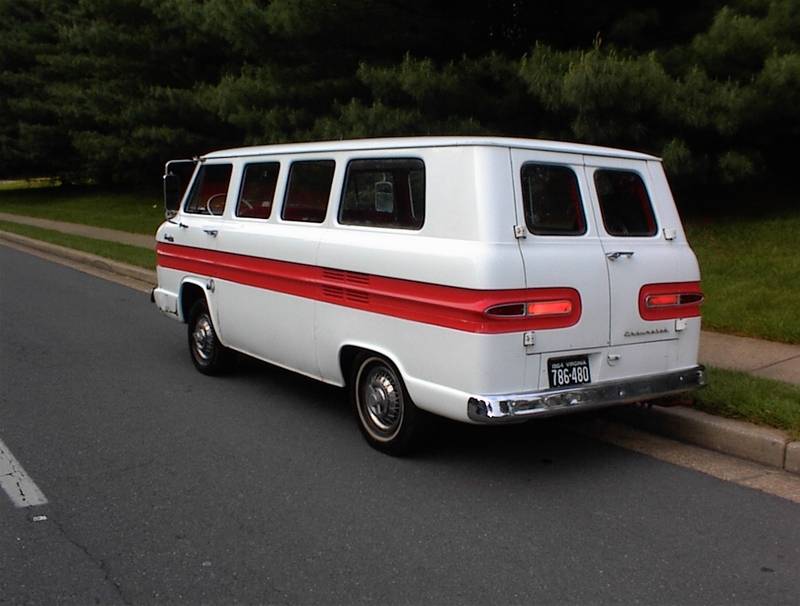 BTW, if you think you've seen this GB before, it was a regular at Corvair meets in the Southeastern US during the late 80's and early 90's, owned by a Roanoke Valley Corvair Club member. We even saw it at the '88 Vair Fair, tho we didn't remember it until someone else mentioned that it was there. 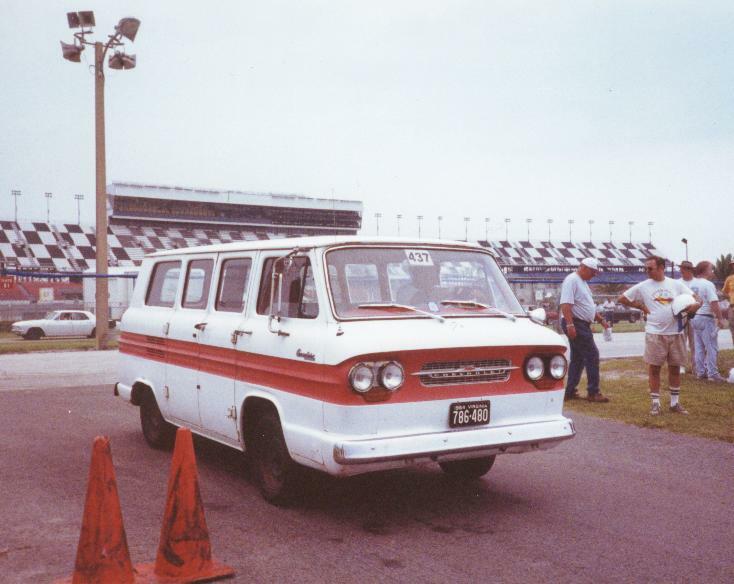 For more info on Corvair vans and trucks, try Rad Davis' FC primer or Kent Sullivan's site which has several sections devoted to FC's, or join the Corvanatics, the club for FC owners and admirers. Click on an image to see the full size version (1152x872 pixels). Above images courtesy G. Skorupski. 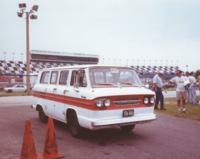 While we were in Daytona, we looked at the FCs to get ideas for our van. 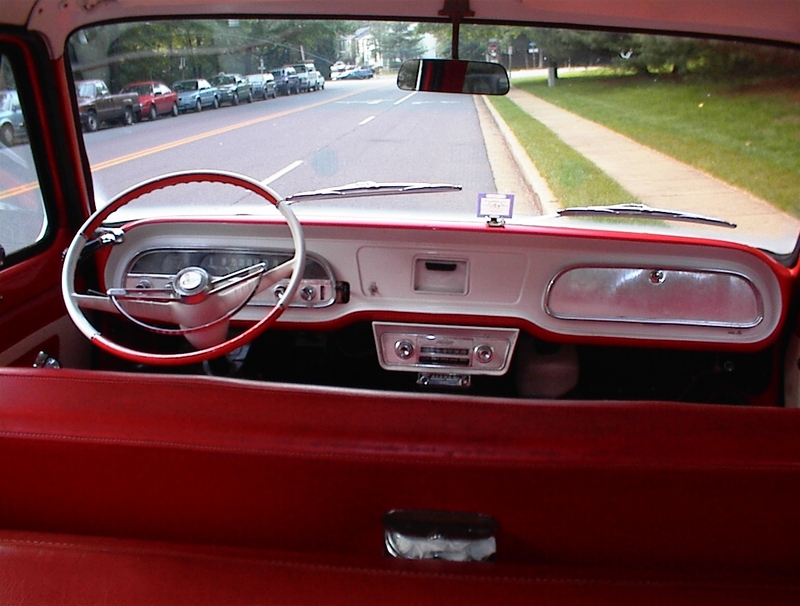 We were thinking about having it painted, but since we didn't want to change out the interior we were going to stay with a red and white paint scheme. The question was, which way - white with red, or red with white. Luckily, we found a nicely done example of each at the convention parked right next to each other. 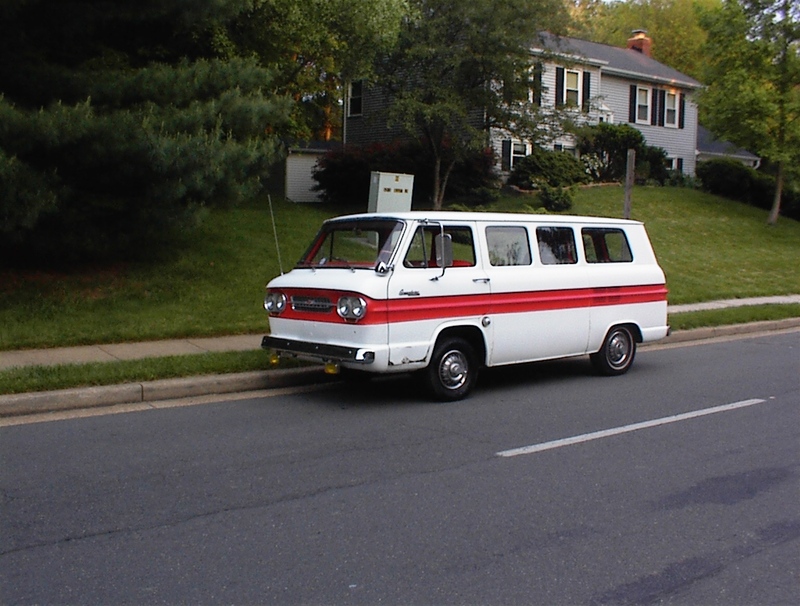 After a few minutes of consideration, the vote was unanimous, and in November 2000 we had it painted red with a white stripe. 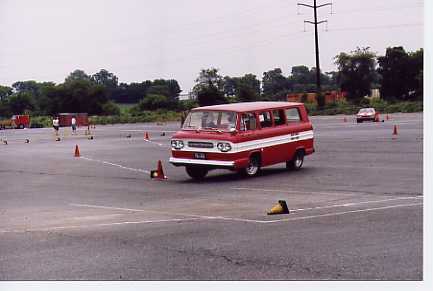 The following year, we took it to the CORSA International Convention - Chicago 2001: A Corvair Odyssey. 2002 turned out to be the year of little things. The Greenbrier faithfully hauled us around to baseball games and a couple local shows. In the meantime, I took care of a bunch of little things - new blower bearing, replaced the ignition, and knocked off some oil leaks. 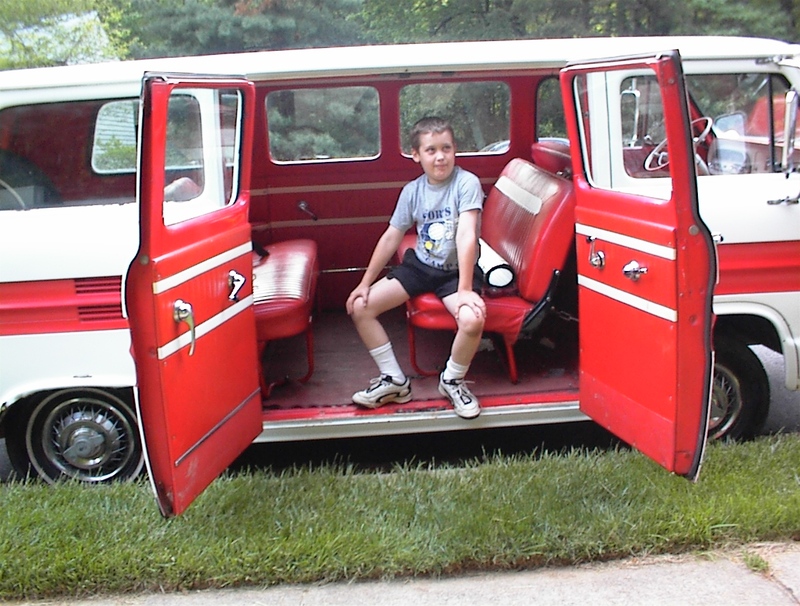 The big job was a complete overhaul of the brakes with new wheel and master cylinders, hoses, shoes, and hardware. Also installed were a set of chrome wheels and baby moon hubcaps with new tires. Much more confident stops now! Since the CORSA convention was in Flagstaff, we elected to stay home, but 2003 was planned for Carlisle, Pennsylvania, so we set our sights on that one. We had a minor catastrophe last year - while driving home something broke and we started trailing oil smoke. We got home, but given the existing blowby on the engine it appears the best course of action is to build a new engine. What's in there now is a late model car engine, so I purchased a 1964 FC case from the Corvair Ranch, and that will be the base for our new powerplant. Last update: 07 November 2008. Copyright Bryan Blackwell.